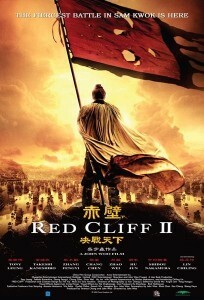 Red Cliff II or also known as Chi bi xia: Jue zhan tian xia is the second episode of Red Cliff or also known as Chi bi. This movie is about the The Battle of Red Cliff in Three Kingdoms era in China. When I saw the first episode of the movie, I was dissapointed because I didn’t know that the movie will be continued to the second episode. The first episode ends with the preparation of the battle. So I was curious how will the movie end. In this second episode of the movie, it tells the story how Cao Cao’s efforts to take over the Red Cliff through land and sea. But his effort can be broken by Zhao Yu who has coalition with Sun Quan and Liu Bei. Superb strategy collaboration between Zhao Yu and Zhuge Liang (Liu Bei’s advisor) could predict the move that will be used by Cao Cao, so they could counter attack Cao Cao’s strategy. The war strategy used is not only for physical attack, but also for moral attack between both sides makes this film more appealing.